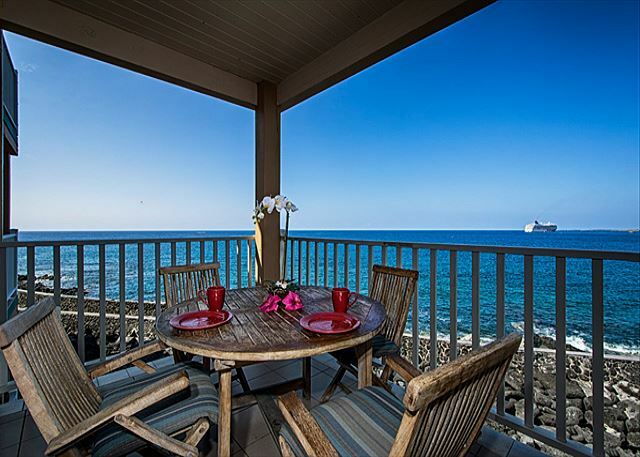 Direct oceanfront living on your lanai! Oceanfront living at it's finest. Living room of 4-205! Tastefully decorated, furnished. Waiting for you! Sofa is a pull out! Another beautiful shot of the living room! DIRECT oceanfront, as you can see! Beautiful pool at the Sea Village! Hot Tub for your enjoyment! The Sea Village has fantastic grounds. BBQ's to enjoy! Tennis courts at Sea Village too! Front of Building 4. A Direct oceanfront building at Sea VIllage. 2nd floor condo! The Sea Village condos from a distance. 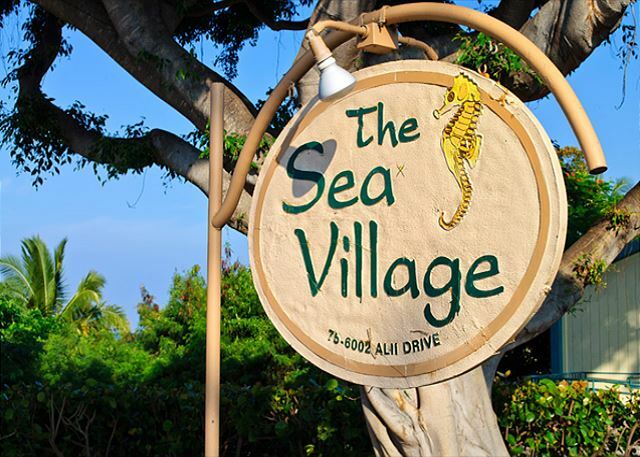 Welcome to the Sea Village! 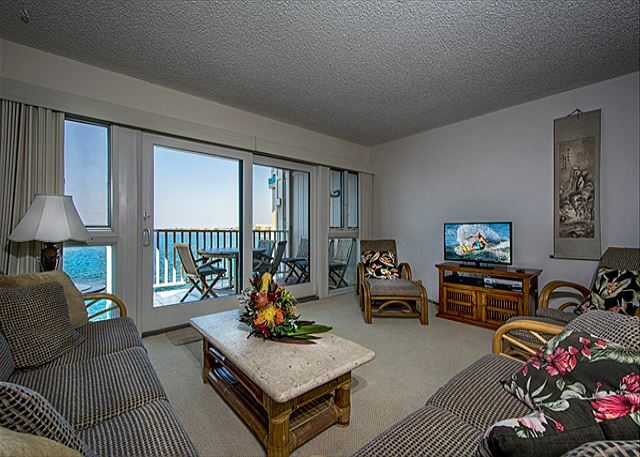 This amazing 2 bedroom direct oceanfront condo is the PERFECT spot for your Vacation. Completely remodeled, extremely clean, the owners have done a beautiful job with this property. 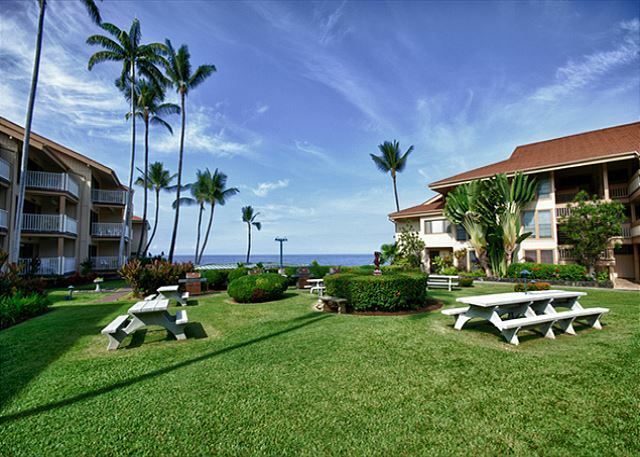 Wifi, Direct oceanfront views, excellent complex, close to town, what more can one ask for? 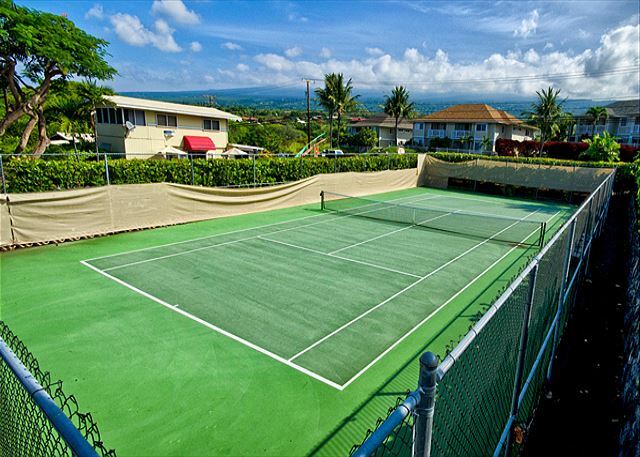 Hot tub and tennis courts available for you! The view was amazing! Condo needs some upgrades, I.e screen door, furnishings are not comfortable and there is carpet. The condo was well maintained and very clean. We would definitely stay there again. Even though the unit doesn't have a/c the ceiling fans and breeze kept us comfortable. The lanai was right on the water and great for having our morning coffee and checking out the action in the bay. We even saw dolphins more than once. The living area was good and kitchen was well stocked. The bedrooms and bathrooms are nice and very clean. The entire complex is older but very well taken care of with lots of plants and good parking. The pool area is very nice with lots of chairs, tables and lounge chairs. I believe the pool is a saltwater pool which is great and they keep it at a good temperature, warm but still refreshing. The BBQs are Webers in great shape and we enjoyed the view while BBQing. The unit is about 15 minutes or so from the airport and you can almost walk to town. I really have no complaints. By the way, it was my wife, my sons, 13 and 17 and myself, we were all happy with condo and complex. Fourth time staying in 4-205. 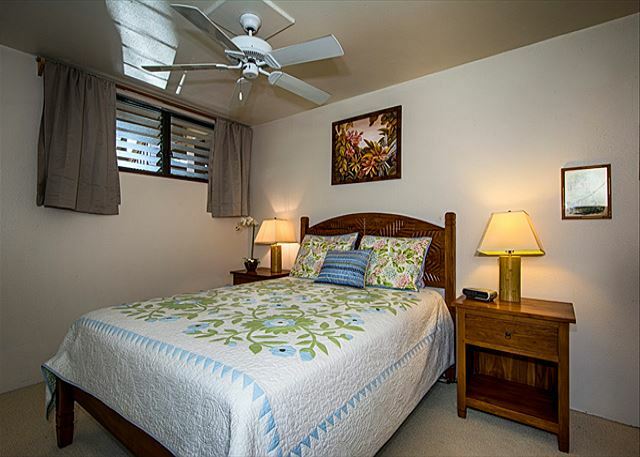 Mahalo for coming to stay with us again at Sea Villa 4-205! We're so happy to hear that you are consistently pleased by your stay. We look forward to seeing you again soon! 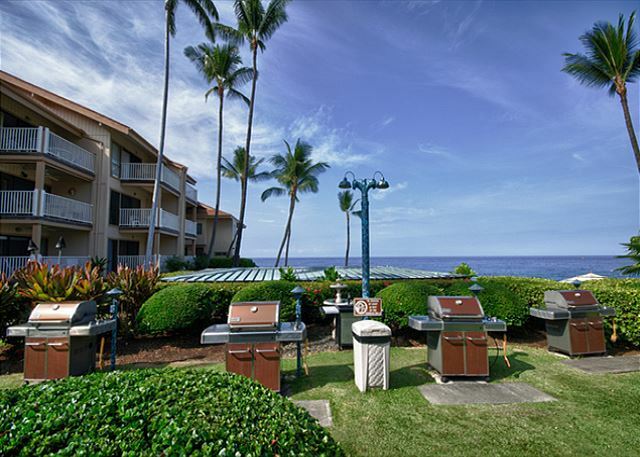 Mahalo for your review, Marsha and we're happy to hear you enjoyed the view! Hope to see you again. The vacation rental was as advertised - right on the water, a great view of the sunset. The apartment had all we needed including lots of beach towels and accessories such as cooler bags, beach chairs, mats, and beach umbrellas. The location was nice but not walking distance to anything of interest. All amenities were a short drive away. Beds were comfortable - sofa bed not very comfortable but OK for children or teens. No AC, but it was not necessary at the time we were there (May). John H from West Des Moines, IA does not recommend this vacation rental. We enjoyed our stay at Sea Village. 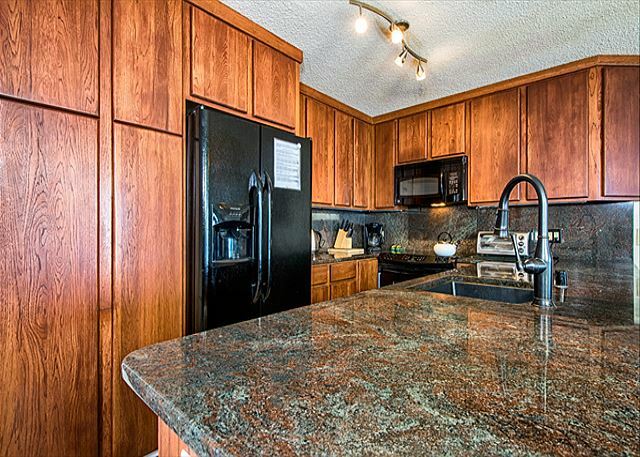 The condo was very clean with nicely upgraded in the kitchen and baths. For the age of the unit it has been well maintained and represented good value for the price. Lot of nice beach gear (chairs, snorkel, fins, etc.). A number of restaurants are within a reasonable walking distance (15-20 mins. ), which is nice since parking is an issue in Kona. All of the pictures on VRBO accurately represent the unit. We would stay there again on a return visit. The only change I would suggest would be to have a smaller table on the lanai. 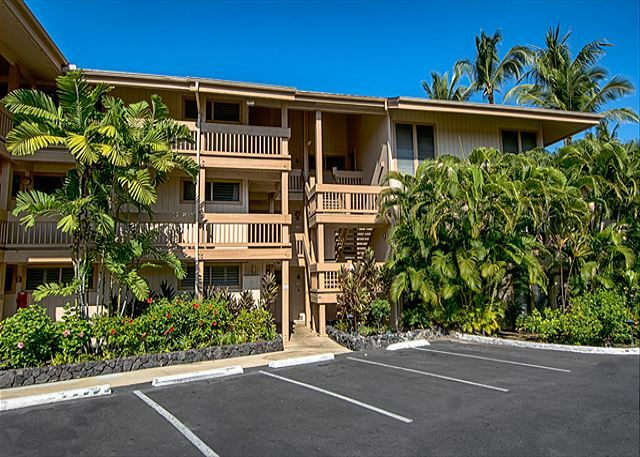 Great location in the Kona area. Management company was excellent to work with and responded quickly to our needs. Checkout/check I was easy despite our arrival in the late evening. Coffee shop on property was a nice addition. This is our second stay at this lovely condo. Very clean and comfortable with loads of beach stuff. 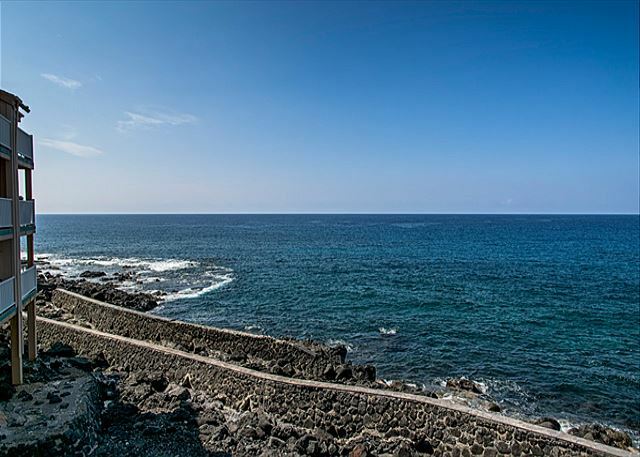 Directly on the ocean for great views and good location in Kona. The trip was great,weather and ocean were great. We spent 3 nights at this villa. The apt. is well supplied, location very good. The only drawback is some noise in the evening from the parking lot. 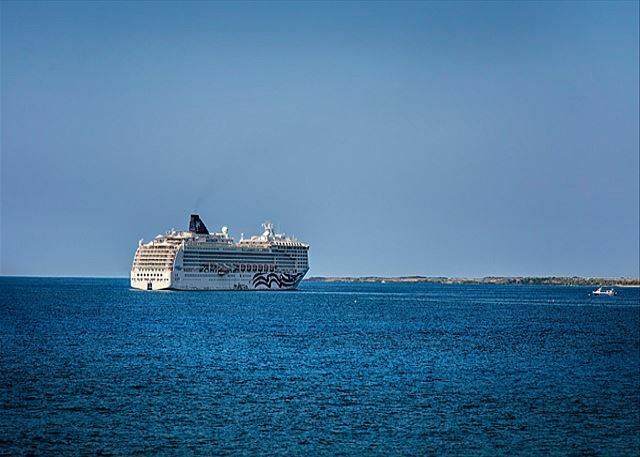 Very nice, loved the sight and sound of the ocean. Loved the Kona area. Should have used the kitchen more and eaten out less. Gave our extra food to a homeless guy as we left town. The bedrooms are at the opposite end, near to the parking lot. Each night there was something going on in the parking lot - a couple and young child packing the car to leave early the next day and the child distressed every time the mom was too far away, so lots of loud voices and car door slamming. Another night someone coming in to an adjoining condo for the first time, late at night. Lock box key only unlocked one lock of two, so phone calls to management asking them to come and get the unit unlocked, traveler "very disappointed" and loud about it. finally I slept on the couch the last night to have peace and quiet. Not sure what could be done about this, but traveler might want to bring ear plugs. Green flash coffee right at entrance to complex. Also travel agent who helped us with some activities right next to green Flash. Unit was very clean and well stocked for our 1 week stay. 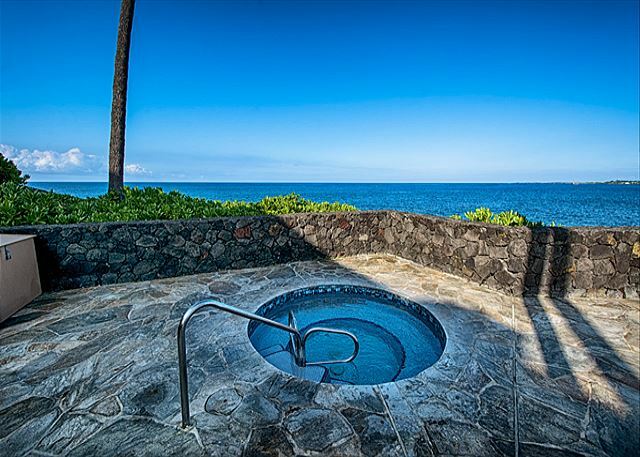 Fantastic view of the ocean from the lanai that we were able to enjoy every morning and at sunset. This is a great condo. The only upgrade it needs is new cushions on the outdoor furniture. That lanai deserves hours a day! Hello, we loved staying at the unit 4205. The Lanai had a beautiful ocean view. We woke up everyday to see the torquiose blue water. The spinner dolphins entertained us as we watched them from the lanai. The house was neat and clean. We used the master bed room and its attached bath. We only felt it was little hot at times during nights as the fan wasn't effective enough, but that is something that did not bother us so much. Also, we found that some of the unused appliances like rice cooker and blender were little dirty and we couldn't use it. Besides these 2 minor issues, we had a very good time at the unit. Will definitely rebook this unit and recommend it to friends too. Wonderful condo with a great view. Loved to watch the waves roll in. Great kitchen and location. Wonderful rental experience - very clean and nice with a beautiful view. The condo was perfect for our needs. 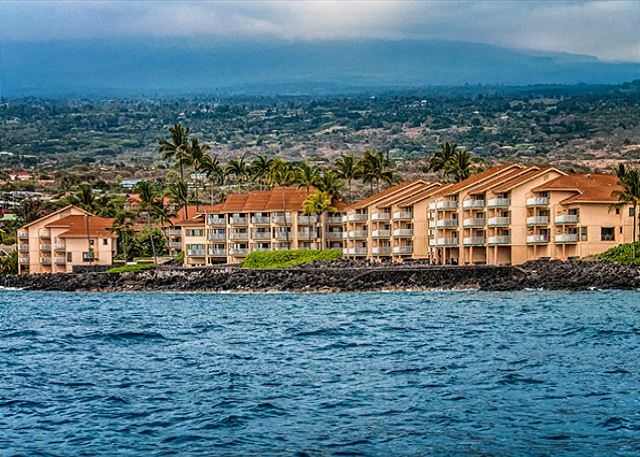 The location, and quality of the Condo was tops and we enjoyed every minute of our time in Kona as a result. We plan to go back and hope to get the same condo. Very good. However the West side of the patio needs a roll up sun screen. When we walked into this condo for the first time my husband and I both were in awe of the view. Wow! We spent many mornings having breakfast and coffee on the lanai and many evenings watching sunset. You can hear the waves crashing against the rocks and it lulls you to sleep at night. The kitchen was well stocked, although we could have used a frying pan but made due with what was there. We slept in the King/ Master and it was very comfortable. A lot of extras were provided: soap, dishwashing detergent, some laundry detergent (although we brought our own). However, make sure to bring your own shampoo and conditioner. The location of this unit is walking distance to town (about a mile) and we walked every morning to get a little exercise. Note that we had an issue with the screen door locking as the frame was not secured to the door jam. When we called after hours it was taken care of within half an hour. We loved this condo! Five stars! This lovely condo met our needs well! The location made it convenient for all we desired to do. We even swam with bottle nose and spinner dolphins in the bay in front of our building! We appreciated the well stocked kitchen and "beach" pantry. 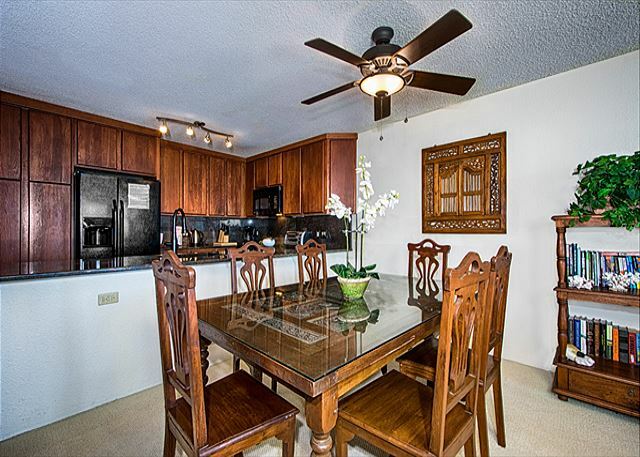 We were very happy with the condo, it worked out very well with our family of four, 2 adults 2 kids. We would stay here again. My family stayed in the unit from 10/3/2016-10/11/2016. My wife was entered in the Ironman World Champs.The unit was clean upon arrival and was everything you could ask for, except maybe air conditioning.The 6 in my family all adults had plenty of room. The view from the balcony was amazing.We had a problem with the shower door in the master bed room, we called and within 1 hour they had someone there to address the only complaint is the shower head in the master bed was installed to low,I am 6ft tall and I kept whacking my head on it.On a scale of 1-5, I give it a 4 ,again no air conditioning. The condo is about a 1 1/2 miles from town, as the say a nice stretch of the legs.I would must definitely recommend this property. I stayed at 4205 in mid-May with my husband and 18 month old. The view is impressive, you're right on the ocean and have a nice view of town. We saw dolphins almost every morning while having coffee on the lanai. At first I wasn't too impressed with the decor, don't get me wrong, everything is in good condition, just a little dated. The condo was very clean. Despite the tired decor, the little extras and attentiveness of the property management more than made up for it. The sleeper sofa needed repair and wasn't finished before our arrival. Management called because there was a part behind the couch and they wanted to make sure my son would be safe near it. They offered to have it removed, even gave me their personal cell number. It didn't turn out to be a big deal and we didn't need the sleeper. The kitchen was well equipped, complete with basic pots & pans, foil, plastic bags, champagne & wine glasses, tupperware, olive oil, basic spices, etc. Anything you would need. There were plenty of pool/beach toys which my son LOVED, snorkeling gear, beach chairs (for adults and children), beach towels, etc. They even had an infant bath, which is nice because there wasn't a bathtub. There is no air conditioning, which is typical for older buildings on the island. Since we visited in May, it wasn't a big deal. We were very comfortable. All in all, we were very happy with the condo and would stay here again. Thanks again to the management for caring about our safety before anything else. Make sure to visit the Kona Inn restaurant specifically for the mai tai's. Best on the island, not too sweet, delicious, and strong! and shops. I would have no hesitation in recommending this property. any email I sent very promptly. All in all loved the whole experience and the Big Island is a fantastic place to visit. Had a wonderful time in Kona. The unit was not fancy from the outside, but was nice and clean inside with some recent updating. The unit was quiet and great location. Sitting on the balcony with the water directly at our feet and the boats floating by was the highlight. We had a wonderful stay. The unit was immaculate and very well organized/stocked. The view is breathtaking and always relaxing. We plan to stay again next year. Follow the check in directions from your vendor. Our keys were on the door handle in a lockbox. Great corner lanai views. Amazing heavy surf pictures. Very clean and well kept. Well stocked. Check before you go shopping. We enjoyed our stay at Sea Village. The basket of fruit in the condo upon our arrival was very nice. Really enjoyed the tropical fruit. I have two recommendations for improvement. I would recommend that the cleaning crew check the refrigerator temperature. The temperature of the fridge was set at 9, the highest, and the first morning, all of our groceries were frozen, even the eggs! And, I would recommend that a property as large as Sea Village, have a maintenance person on site. We came back to the condo one evening at about 5:30pm with take out food from a local restaurant and neither of the keys would open the condo door. (The dinner included ahi poke, raw fish that would spoil if we couldn't get it into the fridge!) I called the after hours number for Sea Village. The person I spoke to said there was no one onsite to help us. Finally a neighbor came to our aid, let us put our food in his fridge, loaned us his WD40, and we were able to get the condo door open. great location right on the ocean. good walk into town with lots of shopping and restaurants. 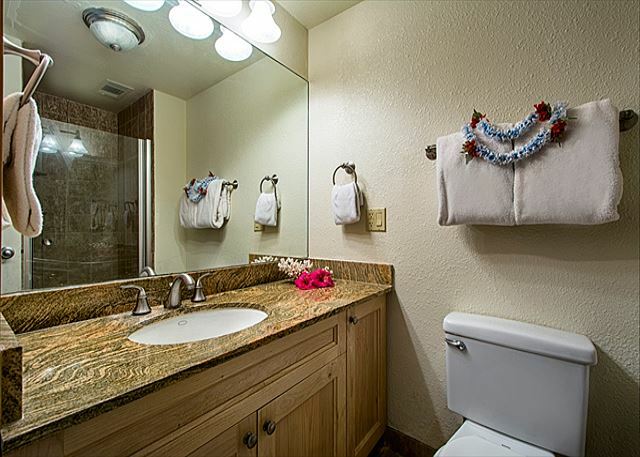 our 2 bedroom 2 bath was well equipped with more beach stuff than we knew what to do with. Additionally the ice maker was an ice producing machine, it was great because it was hot and little to no trade winds so the ice maker got a work-out. only suggestion is to replace the cookware as it was old and incomplete, only 1 6 inch fry pan, ended up cooking a lot in the large boiling pan, it worked but really? Didn't quite fit with how the rest of the accommodations were. overall great place, priced right, and what a view. will stay there again. This is a great unit. Great location. Wonderful view. The only problem was that the refrigerator was not reliable and we had to deal with that for the whole week. Property management didn't do anything to help and that was a disappointment. With everything else they were great. Get a new fridge and it's perfect! Kona, a Wonderful Place to Be! Loved the location and price. Loved the ocean breeze. Loved the nice walk to town every morning. Loved the dolpins in the morning! It could have had a larger frying pan for cooking in and the dishwasher was not working. I would stay here again in a heartbeat. Nancy C does not recommend this vacation rental. Beautiful view. Place good use a good cleaning and living room furniture replacement. Marginally stocked with products. No coffee or creamers. Maybe because we just came from a place on Maui that had everything we could want. No A/C but place stayed comfortable with fans. Good location. We were very pleased with this apartment. We were not sure what we would find, but going in we immediately regretted not having booked a longer vacation there. The apartment is large, comfortable, very nicely decorated, has everything you need. The ocean view is SUPERB! It was very clean, and had towels, chairs, etc to bring to the beach. Being able to use the washer/drier, was fantastic. we didnt have to talk to anybody at all. Sleep quality was great, no noises at all. Only problem was that it was a bit hot and there was not A/C but other than that I totally loved the place, is good value, and I would definitely come back. 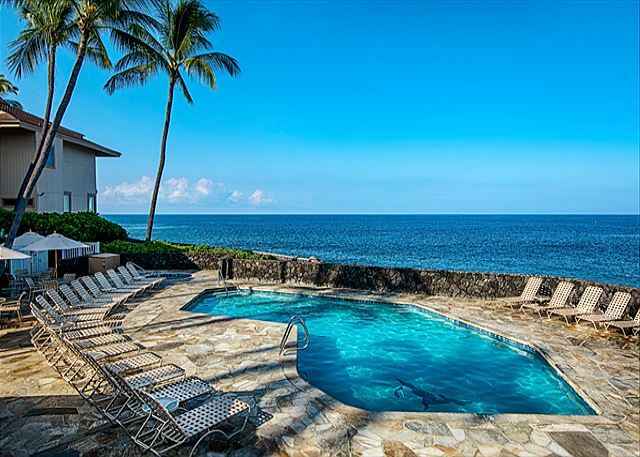 Sea Village is one of the nicest oceanfront properties in Kona. We have booked this property through Knutson for the last eight years and have always been impressed with their willingness to help with any requests for assistance. We have already booked again for 2015. Everything was a delight. We were thrilled to find a Welcome Goodie Basket in the fridge upon our arrival. The location to Kailua was close and quiet, no road noise. Loved the locally run coffee shop on site. The only one minor observation was that we could hear the people above this unit walking around. Other than that. . . perfect. When we arrived we had a basket of fruit and goodies and a note saying the sink is broken. Please don't use the sink or dishwasher. Bummer. We had to be the middleman between the plumber and the management company on when to have him come out. It took two visits, with loud machinery to get it fixed. We arrived Sunday and it took till the end of day Tuesday to get it fixed. No concession. Maybe the fruit basket was the concession?? Who knows. The location was great! Beautiful views. Overall the place was furnished well. New carpet. Tons of beach material (chairs, mats, toys, towels, coolers, boogie boards). We would stay here again. Good Coffee shop on the property too. We have been using Knutson's services for many years and it has always been a pleasure doing business with them. Any calls for service have been promptly and cheerfully answered. Morning coffee watching the dolphins, how relaxing! The fruit tray upon arrival was very nice, the kitchen was equipped with all we needed and everything you need for a day at the beach was available. Nick at Knutson's was very helpful with our arrangements. Hope we are able to use this condo again very soon. We had a great stay at Sea Village. It is well-maintained, well-equipped, quiet and excellent location. Nick at Knutson & Associates was very responsive and highly professional. Highly recommend. 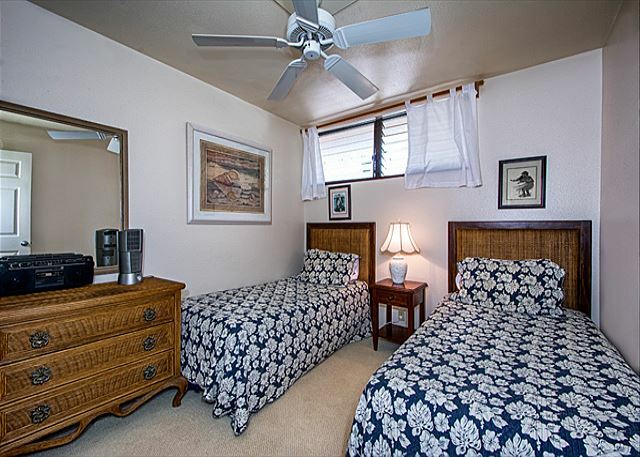 The unit is comfortable and very well equipped, and feels more like someone's home than a rental. Small repair and maintenance items were well handled by the management. Very nice location. Gorgeous moon sets and dolphins galore each morning while having breakfast on balcony! We arrived to a complimentary basket of local fruit. The condo was very clean and well appointed. 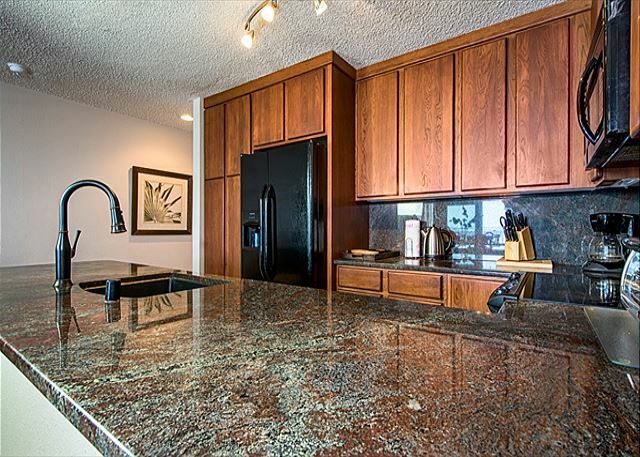 In face we were very impressed at the size as well as how modern it was with granite and updated appliances. The beds and the pull-out were very comfortable. 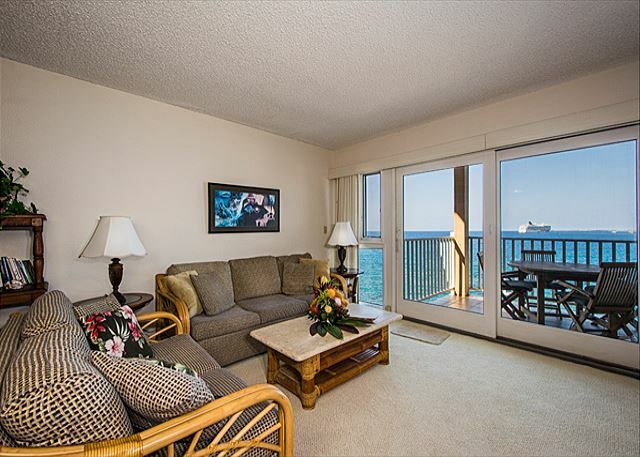 The most enjoyable part of it all is the view and the ocean breeze and sound flowing through the entire condo. The location is perfect and not far from the town and amenities. We loved the Island and will definitely go back and hope to once again stay here. Thank you to all who helped make our stay comfortable and enjoyable. We highly recommend this rental to everyone! It was the perfect place for us. We loved the condo!!! beautiful sunsets and listening to the waves from our Lanai were priceless. The condo was fully stocked with beach supplies(coolers boogie boards chairs etc..) The owners had a lot of really good info books on Hawaii. The condo complex is very well kept . For us to walk to Kona took no time at all. 4205 was perfect for our family!!! We will definitely be back!!! 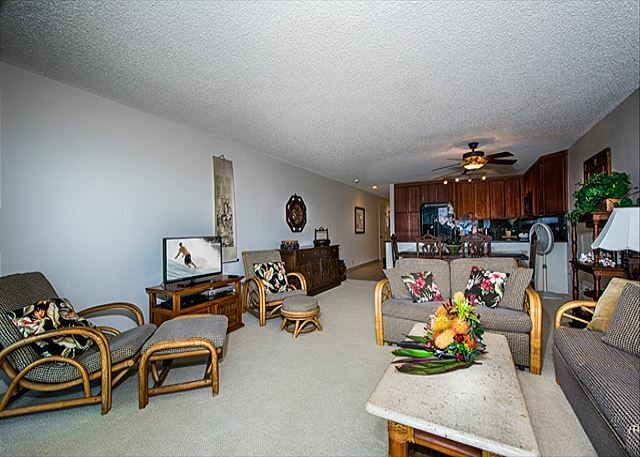 The condo we use at Sea Village is also used extensively by the owner and has a real family home feel to it.